I have some exciting news for you ladies today. The Jeweler's Wife is giving away $300 in monogram jewelry from their website. Who doesn't love a piece of bling with their initials on it? They offer so many options and designs. Whether you are looking for a traditional piece or something more modern, they have you covered. Below are some of my favorites from their site. I personally own a few items from The Jeweler's Wife and have been beyond impress with their quality and customer service. They offer stellar pieces from some of the most popular and well known brands. All you have to do is fill out this quick, to the point form to be registered. It takes 2.2 seconds for a chance to win $300 in monogrammed jewels. Totally worth it, right? Also, to be eligible for the winnings, be sure to follow The Jeweler's Wife on Pinterest and pin a few of your favorite monogram pieces from their board. You are now good to go. Good luck!! Contest ends March 31, 2014. Disclosure: This post was sponsored by The Jeweler's Wife, but all opinions expressed are my own. I 100% believe in this company and their offerings. I only share products and companies that I fully back with confidence. Thank you for this great giveaway Shanna! monogram everything!! I love it! A monogram necklace has been on my wish list....gotta check this out! I have a monogram necklace and I love it as an everyday piece when I don't feel like wearing a big chunky necklace! Ah! I love monograms! Cute stuff! Ahh I would love to win this!! I am not allowing myself to purchase anything monogrammed right now because I am getting married in a year and my initials will change... but if I won this I would just go ahead and order stuff with the new initials!! I would love to wear it in an engagement picture or something like that! Thanks, Shanna!! Loving all of these pieces! I've been wanting to get a monogrammed piece for a while! I also do not have a monogram necklace or monogram anything. 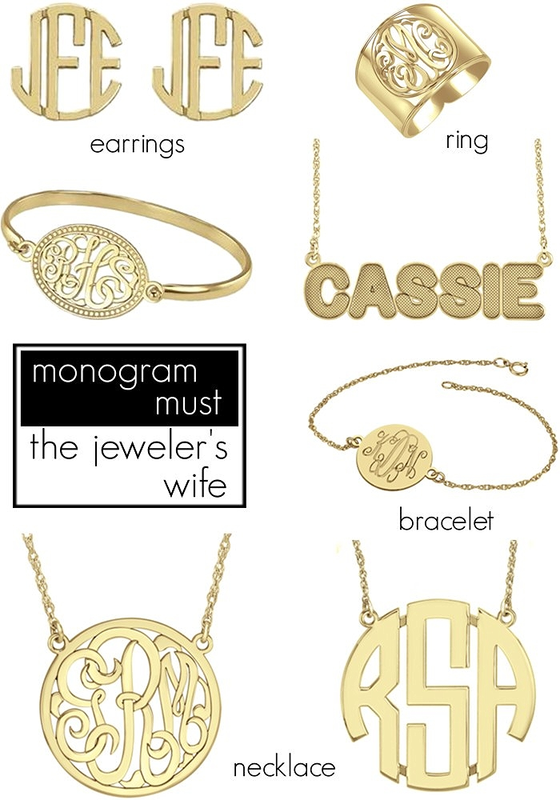 I'd love to get a monogrammed necklace or bracelet. I also love a lot of their rings! From what you have pictured I love the ring and the bracelet under the ring. The classic bracelet is gorgeous! This company is BEYOND adorable!!!! I love everything. Thanks for sharing the giveaway!! DISCLAIMER: I occasionally partner with brands and companies to review a product. Compensation is provided on a case by case situation. I am also a member of affiliate programs that provide commissions based on purchases made from links within a given post. Please note that all opinions are 100% my own and I only accept sponsors and products that fall into line with my site.